Below you can find driving directions from Google Maps to help you get from Homestead to your nearest Fix Apple Now store, situated in Weston. You can either copy the driving instructions below or click here for a larger map and driving directions. Fix Apple Now can help you if you've been faced with a broken Apple device in Homestead. We pride ourselves on our ability to solve problems with iPads, iPhones (4,5 and 6), Mac Minis, iPad Minis and iPods quickly and get right to the root of the problem to prevent it from returning. Why not get in touch with Fix Apple Now today if your Bluetooth isn't working, your device isn't charging, you have a cracked or frozen screen, your device won't switch on or off, you're seeing “no SIM card” errors or your music apps are crashing? We offer some of the best prices in the business. Our engineers have the skills and experience needed to deliver the outstanding solution that you're looking for. 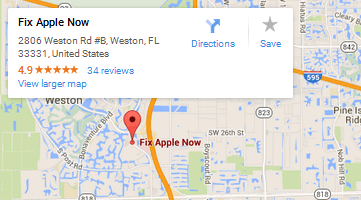 There's no need to go anywhere else if you need to repair your Apple device in Homestead. Talk to us today if you need to fix, repair or restore your device without paying more than you need to. Take FL-821 N to FL-818 W/Griffin Rd in Davie.